Buffalo Soldiers was a name given to two cavalry regiments and two infantry regiments. These US Army units were made up entirely of African American soldiers. The Native Americans had such great respect for the fighting abilities of these men that they called them “Buffalo Soldiers,” because of their strength and courage they displayed during battle. Given Native American reverence for the buffalo, the soldiers wore the nickname proudly. The Buffalo Soldiers won 20 Medals of Honor, more than any other regiment. They also helped lay hundreds of miles of roads and telegraph lines, protected stagecoaches, were involved in the military actions against the Apache chiefs Victorio and Geronimo and fought bravely in Cuba during the Spanish-American War. In the 1950s, Buffalo Soldier regiments were disbanded when all military services were integrated. Sergeant Mark Matthews was born in 1894 in Alabama. He grew up in Ohio and rode horses as a child, delivering newspapers on his pony. 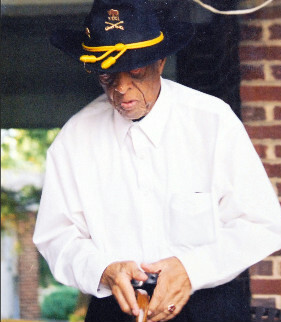 Matthews joined the Buffalo Soldiers’ 10th Cavalry Regimen after meeting members of the Calvary while visiting a Lexington, Kentucky racetrack during his teens. One of Mr. Matthews’ duties was assisting the 1916 search for Pancho Villa in Mexico. He was later transferred to Virginia, where he took care of President Roosevelt’s horses and was a member of the Buffalo Soldiers’ drum and bugle corps. In his late 40s, he served in combat operations in the South Pacific during World War II and achieved the rank of First Sergeant. He was noted as an excellent marksman and horse showman. Leaving the United States Army a few years before it was integrated, Sgt. Matthews then took a job as a security guard in Maryland, rising to the rank of chief of the guards and then retiring in 1970. 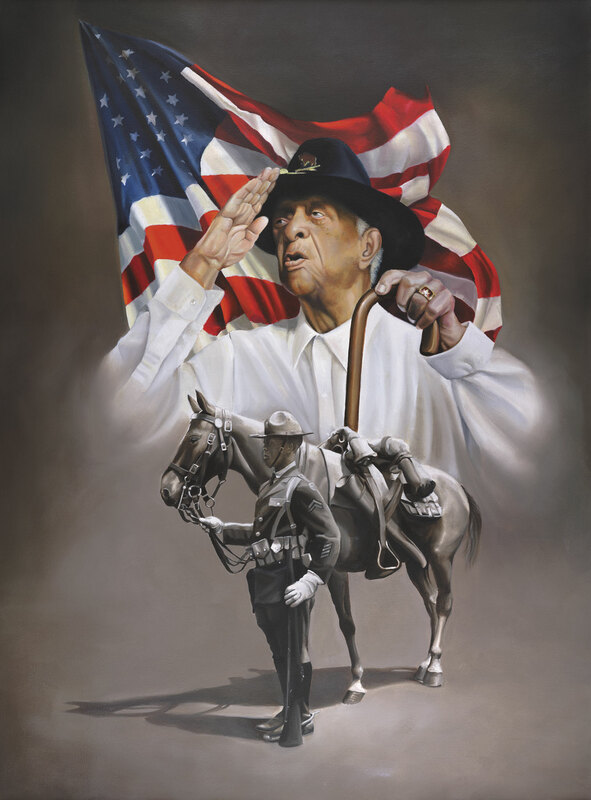 After the war, he told stories of military experiences and grew to represent a symbol of the Buffalo Soldiers. He met with Bill Clinton and Colin Powell in his later years, and dedicated a barracks in Virginia in honor of the Buffalo Soldiers. In 2001, artist Tim Hinton had the honor of meeting Sgt. Matthews. Mr. Hinton took several photos of, one of which was used for “Final Salute”. 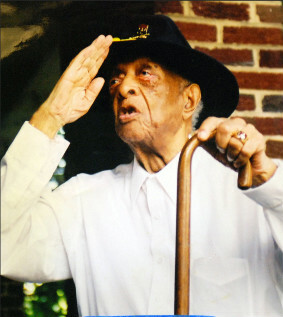 Having experienced excellent health for most of his life, Matthews died in 2005 at the age of 111 and was buried in Arlington National Cemetery. 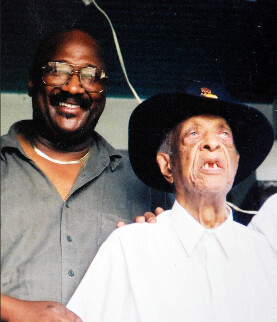 At the time of his death, he was recognized as the oldest living Buffalo Soldier.